My Ten-Tec Jupiter-based station. In the foreground is my Ten-Tec 777 headset. Behind that is my Ten-Tec 538 Jupiter (early model). Atop that is an MFJ-993B IntelliTuner automatic antenna tuner. Atop that is an elderly AEA (now Timewave) DSP-232 running APRS in conjunction with the laptop at the left and an unseen VHF radio set to 144.390 MHz. At the very top is a SignaLink USB that I use between the Jupiter and my computer for digital modes such as PSK-31. I love my Ten-Tec Jupiter. Very good rig! But I noted earlier that I had trouble feeding it audio for HF digital work because the line input via the AUX1 connector is remarkably sensitive. I had to put a 10:1 voltage divider in the SignaLink USB to cut the audio down to what the Jupiter would accept. It works, but the Jupiter is still too sensitive and the adjustment takes some finesse. I contacted Ten-Tec to inquire as to the “small hardware modification.” Garry Green, N4CJX, at Ten-Tec replied with a single JPEG image. I zero in on the relevant part in the following photo. Here's the photo I received from Ten-Tec, noting a resistor that needs to be replaced with a 33K-ohm resistor. No other instructions were provided. Photo from Ten-Tec. I wouldn’t exactly call this single photo a complete set of instructions for making the modification, so I investigated further prior to opening up my Jupiter. I dug into the instruction manual, which comes with extensive parts-layout drawings, schematics, and bills of materials. Here’s a close-up of Figure 4-15 from the original instruction manual, which is the parts layout diagram for the Digital Signal Processing (DSP) printed circuit board (PCB). Note that this is a high-res scan. The modification is to replace R52. I added an orange arrow to point out the part. This is only a tiny portion of the diagram—I couldn't read it without a magnifying glass. As it turns out, the part is R52 on the DSP PCB. Okay, let’s find out what R52 is. Here’s a closeup from Figure 4-11, the audio input/output portion of the DSP PCB. Ten-Tec Jupiter schematic shows that the resistor to be modified is 330K-ohms. I circled R52 with a blue ball-point pen. Ah! No wonder it's a "small" modification. Look at the size of R52. It's about the same size as the "N" on the dime. Uh…yes, it’s a “small modification.” Very small. I put a dime in the photo so you can see just how small it is. 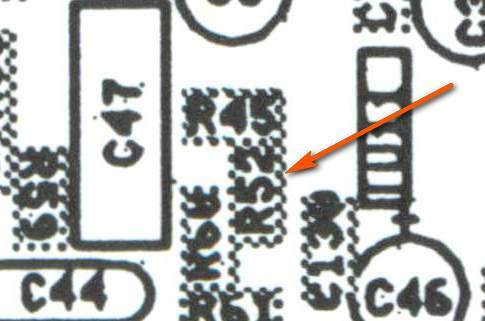 Compare the size of R52 (orange arrow) with the “N” in “One Dime.” Also note that the integrated circuit just to the right of the part is actually a surface-mount device, itself very small. P.S. Opening the Jupiter requires dealing with some screws with a weird star pattern that won’t accept a traditional screwdriver. I didn’t have the right tool, but found that a 5/64-th hex key (Allen) wrench, if used gently, works. 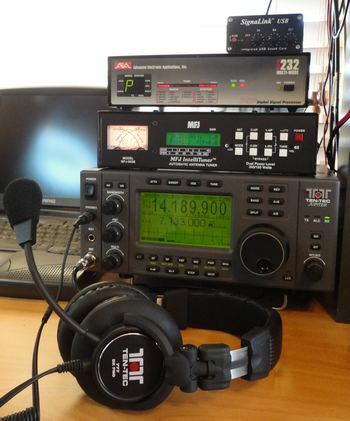 This entry was posted in Ham Radio blog entries and tagged Ten-Tec Jupiter. Bookmark the permalink. Hi Skips, I would love to do as you suggest, which would most certainly work. However, take a look at the photo. 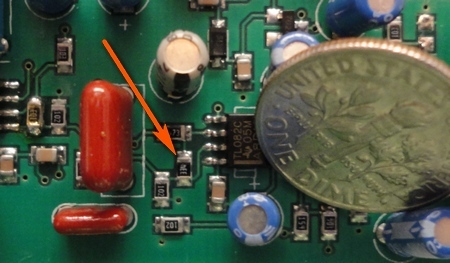 The resistor in question is a surface-mount device that is smaller than the N in ONE DIME. Further, it’s down on the board next to some tall capacitors. I don’t have the skill or tools to tack a 33K resistor across the 330K resistor—the area is simply too hard to get at. Why one wouldn’t just solder the 33K resistor on top of, and in parallel with, the 330K is beyond me. The total resistance will be within 10% of a 33K resistor. DONE faster, safer, AND easier. Armol, wow, you must have the hands of a brain surgeon! Not only is the surface-mounted resistor no larger than the N on a dime, but it’s buried near some rather large components on the board. Tackling this job is way beyond my skill level!